오늘은 저희 친구들과 가족들에게 (그리고 크리스 신부님 부모님들께!!) 핵꿀맛 겨울 간식인 붕어빵을 소개해줍니다. 붕어빵은 제가 한국에서 겨울마다 안 사먹고 못 버티는 간식인데요 - 저희 친구들도 영국에서 제대로 된 붕어빵을 경험해볼 수 있게 노력해봤어요... 직접 만들어보기까지 하면서!! Today we introduce our friends and family (and Rev. Chris' parents!!) to the wonderful winter snack of Goldfish Bread. 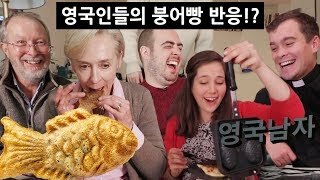 This is one of my absolute must-have snacks every Korean winter - so we try and share the full experience with our friends here in the UK… even trying to make our own! !